Do you remember who the leaders were when you were a member? Annie Belair was a leader? Barbara Gaertner was a leader? Joe Shepstone was a leader? Barry Bendell was a Seniors’ leader? Kim Sayers was Seniors’ leader? Bill Baldwin was leader? Laurie Consaul was involved? Diane Kitching was a leader? Martha Camfield was a Seniors’leader? Ernie Brodo was Chairman and Advisor? Paul Hamilton was Chairman? Herb Groh was involved? Rob Lee was a leader? Ian Huggett was a field trip leader? Susan Laurie-Bourke led art workshops? Chairmen, Advisors, Leaders of workshops and field trips. Who are they? Macoun Club leaders are all volunteers from the Ottawa area’s naturalist and scientific community. Currently. all are members of the Ottawa Field-Naturalists’ Club, but prior to about 1980 most were also scientists at the Canadian Museum of Nature (formerly the National Museum of Canada) when it was also one of our two sponsors. Some leaders were Macouners when they were young. Others are the parents of children who grew up in the Club. Only one of them — Herb Groh — was old enough to have known John Macoun personally. Kim Sayers brought a dual background to the Macoun Club in the latter part of the 1990s. She had first done graduate research in botany, and later trained as a high-school science teacher. She led many Seniors’ field trips and camping trips. 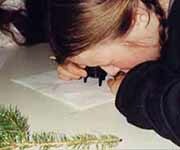 Here she is birding with Hugo Kitching and Karl Grenke, using the Club’s old spotting scope. After taking a teaching post in the United States, Kim eventually returned to Canada, and is again teaching high school in Ontario. Martha resumed her involvement with the Macoun Club in the mid-1980s as a leader, which she kept up for the next 24 years. 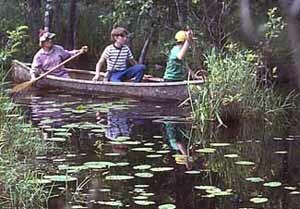 In the early years, she adventured with us on Pakenham camping trips (she is shown here steering the old canoe with members Lorin Gaertner and Amber Stewart) and invited us to spend a number of memorable weekends and March breaks at her family’s remote cabin near Kazabazua. Martha turned ill and died on July 4, 2010, two weeks after attending our annual party. For more than 10 years, from the late 1980s to the middle of 2002, Laurie Consaul cheerfully worked behind the scenes in the month-to-month planning of our regular indoor meeting program. Like all members of the Macoun Club Committee, she is a member of the Ottawa Field-Naturalists’ Club, but at the time she was the only one on the staff of the Canadian Museum of Nature (as a botanist). Laurie was therefore also been an essential link between the Macoun Club and our home-base sponsor. Our affairs would not have run so smoothly without her efforts. From time to time, Laurie joined us on field trips. 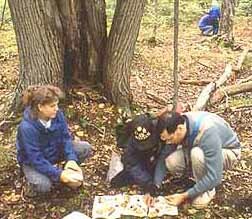 Here in this photo, she and fellow leader Claude Haridge help members identify mushrooms they have found in the forest, and brought together for examination. Just as she was starting out for a new phase of her career (a university professor) Laurie suddenly became ill. She died in December, 2012. She still does in most years. Every year since 1986, Susan has come in to Macoun Club meetings with her art supplies, and worked with the individual members to help them create detailed drawings of plants, animals, fossils, and shells. In the process, they have learned to observe more closely, and apply the techniques of fine art to their subjects. Here she works with Susan Oda and Morgan Rowe. This day, Morgan drew a spruce branch, below right. Susan was a member herself in the early 1970s, and with the enthusiastic encouragement of the Chairman of the Club, Dr. Ernie Brodo of the Museum’s botany division, she developed a career as a scientific illustrator. She has worked independently most of the many years since. Ernie has high praise for Susan’s talent; her drawings of lichens have enhanced his books on the lichens of the Ottawa area, and also Lichens of North America. She has illustrated archaeological reports for Parks Canada, too. After leaving Macoun Club for a second time, Barry travelled widely in China; from his stories, we got the impression he had been living on Yak butter. He then settled into years of field study of marine invertebrates in the sea grass beds of southern Thailand, which are so important for the Dugong, or Sea Cow. Around 2006 he was pursuing graduate studies in Australia..
Joe (seen here with young Macouners at Britannia) became a Macoun Club leader in the late 1980s, but for many his memory is almost inseparable from the other, non-human members of his household in those days: the frogs, fish, and turtles, the Cane Toads; the iguana, the boas and pythons, and Madagascar Hissing Cockroaches. 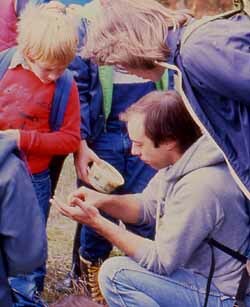 Joe had been a park naturalist in Murphy’s Point Provincial Park, but when he came to us he was working in Ottawa-area school systems, bringing his collection of fascinating creatures to classrooms all over. There, as in the Macoun Club, children respectfully gave him their fullest attention. The reptiles and amphibians have since found new homes, and Joe, now describing himself as a ‘naturalist-at-large,’ works outdoors a great deal, designing and building environmentally friendly gardens in his rural community. During the late 1980s, Ian always seemed to attract the most adventuresome Macouners on any given field trip. He made them really stretch their legs, and together they explored out beyond our usual range. Here we see him and one such group at Mary Stuart’s, in the Pakenham Hills. Left-to-right: Judith, Mandy, Rebecca, Nicolas, and Andrew. Then as now, Ian is a tireless and forceful campaigner on conservation issues, from neighbourhood development threats in his home town of Aylmer, Quebec, to the world-famous old growth rainforests of BC’s Carmanagh Valley. Paul was one of those former Macouners who grew up and came back as a leader. Between 1986 and 1988, he was in charge of the whole Club, running every indoor meeting of every group, and present on every field trip. As a high-school student, Paul sought out Macoun Club for himself; once there, Dr. Brodo introduced him to the microscopic world of algae that has become Paul’s career. He joined the scientific staff of the Museum after graduating. 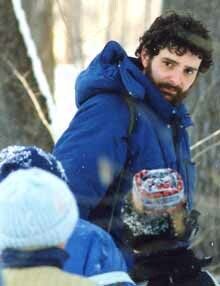 His research has taken him up and down the Rideau River, into the High Arctic, and to Indonesia. Like Ernie Brodo, Paul inspired at least one member of another generation of Macouners to come back as leader: David Manga. If you remember Dr. Brodo, then you’re thinking back to the eight-year period from 1967 to 1974. Here he is in 1968 (with Cameron Bennett looking on). Irwin Brodo came to us from the Bronx. Scouting, he says, was his ticket into the natural world beyond New York City, and his interests led him into botany. 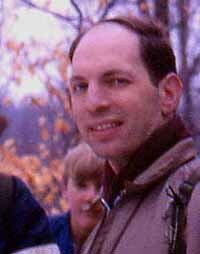 He became a lichenologist and joined the scientific staff of the National Museum of Canada, as it was then known. Ernie involved the whole Senior group in a series of projects, the most lasting of which has been the exploration and intelligent description of the “New” Macoun Club Nature Study Area at Bells Corners. More than 30 years later, we are still at work there. He also encouraged individual members, like Paul Hamilton to develop their interests and abilities in ways that subsequently developed into careers in the natural sciences. In 2000, after about 35 years with the Museum, Ernie retired. But he works on with undiminished enthusiasm. The first of his old projects to see completion has been the wonderfully readable and beautifully illustrated book, ‘Lichens of North America.’. For more than 20 years, Herb Groh was our living link to John Macoun, the famous man the Club is named after. Herb was born in 1883, and for several years around 1910, when he was working at the Experimental Farm, Herb often turned to Macoun for help in identifying difficult weeds. As his career slowly developed, Herb Groh eventually gained recognition as a pioneer in the study of the weed floras of Canada. In 1948, Herb and Bill Baldwin founded the Macoun Field Club. Fifteen years later, it was said that he had never missed a field trip. Here he and member Rosalyn Burt approach a beaver lodge left high and dry by falling waters. Herb also sat in on most Saturday morning meetings until the late 1960s, when he was well into his eighties. Herb Groh died in 1971. Bill Baldwin practically started the Macoun Club. Before that time, a few children tagged along with the adult Field-Naturalists on their weekend field trips. Bill thought there should be something just for them, and in the spring of 1948 he gathered together a group of leaders like Herb Groh, and together they made it happen. Bill was a botanist with the National Museum of Canada (he retired in 1972), as well as a member of the Ottawa Field-Naturalists’ Club. 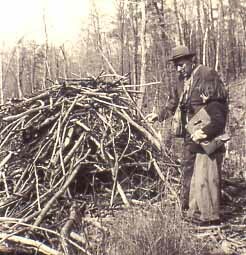 Here, in November 1950, he has spread out a number of dried plant specimens (and other strange things) for members Cynthia Millman and Nancy Ferguson. In after years, he was remembered as an inspiring teacher who communicated his interest by listening to what the young members had to say. He died in 1979. All photos donated or provided by members and leaders, past and present. Created January 2002; most recent updates in 2006, 2010, and 2015. Coding revised in June, 2016.